Hi, how's it going? I'm Victoria (Vicky) here is my entry for the 2018 Halloween Costume Contest! This entry was conjured up and submitted during October 2017, This idea was derived from my imagination and expresses my real life like of make-up! I love wearing make-up, definitely lipstick, and eyeliner, and what better way to express my inner costume character of a makeup queen. 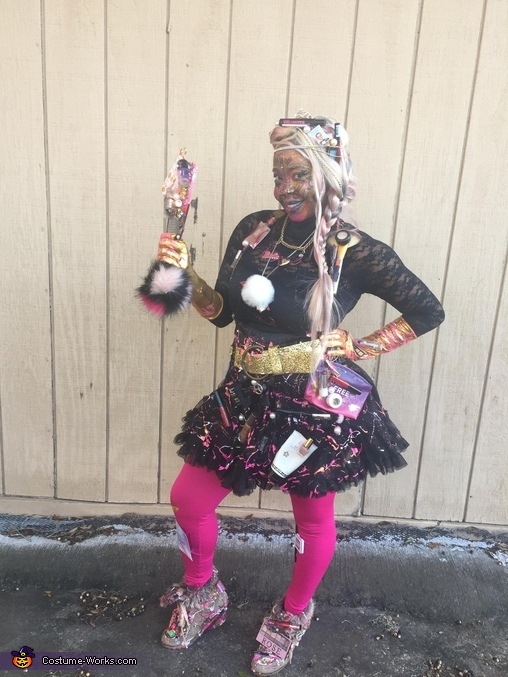 She has a hair full, skirt full, leggings, gloves and a mirror that is plastered in nothing but makeup, samples, lipsticks, eyeshadows, blushes, foundation, oh, and nail polish and more of her favorite items! How I created this: I already had a black leotard pink leggings, mirror, bra, gloves, necklace, suspenders, shoes, and the gold belt. The tutu skirt was purchased and given to me from my mom and when I saw it, I thought and later decided it could be used to piece together this character. I simply gathered around items and accessories I already owned and painted then hot glued mainly empty or slightly used make-up pieces to my tutu skirt, gloves, leggings, mirror, belt, necklace, suspenders, wig, shoes, and bra. I went out, purchased and spray painted the blonde wig. Lastly, I hand sketched and drew on mascara, eyeshadow and etc for the face makeup. This was absolutely too much fun! I loved, loved, loves putting this together! I can and must say and she would definitely agree with me that the Makeup Queen RULES!